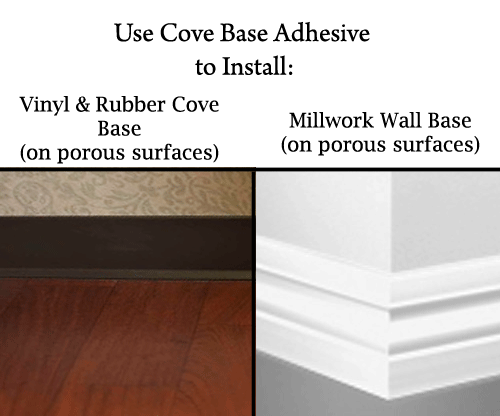 Easy to apply cove base adhesive is the adhesive that professionals use to install cove base. 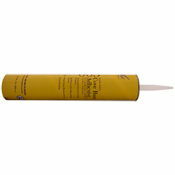 This large 30.5oz tube of cove base adhesive has an aggressive initial grab and the strength to hold in residential or commercial applications. The cove base adhesive can be used on either the 4 foot sections or the 100 or 120 foot coils of cove base. Use the 3 Inch Adhesive Applicator Nozzle to help spread the adhesive for better professional results. The cove base adheisve can be used on porous surfaces such as gypsum drywall, dry concrete, plaster, wood, plywood, well bonded paint, brick, and sanded plastic laminates. This is a 30 oz tube and will NOT fit a standard caulking gun. You must use a Cove Base Adhesive Gun that is large enough to hold the 30 oz tube of cove base adhesive. Clean up wet adhesive with a cloth, soap, and water. Dry adhesive can be cleaned up with mineral spirits. Approximate Coverage:25 lineal feet per tube for the 4" high base. 15 lineal feet for 6" high base. Material Safety Data Sheet for this product.